It’s a nice evening. 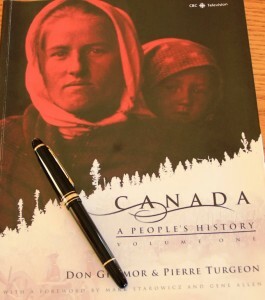 Just looking back in time while trying to ponder how much it is that I have changed since I moved to Canada from Europe. In the end, and I had to consider this carefully, I decided to say “a lot”. Or maybe “completely”. The change happened gradually and not only it was ‘big’ but also ‘harsh’. It feels good now, but it was a long journey. I am happy I took it. This evening I came across what Darwin said, and even though he is not one of my favorites, I’ll quote: “It is not the strongest or the most intelligent who will survive but those who can best manage change.” Isn’t that something? Just think a bit more about it. So, you’re in Canada now. You’re excited and ready for a new start. You’ve done your research – or some research – as many told you that the more you know, the better equipped you’ll be to handle the ups and downs that you’re most likely going to face in your new country. As we’re taught in school, one may “ace it” at a theoretical level, but realize soon enough that the implementation phase still requires some work. That theoretic knowledge helps you through the initial excitement and moves you on to the difficult part. Here you have to put forward your credentials and work experience with the same confidence and make sure to keep your cool when harshly labeled “overqualified” in a job interview. Just another one of the many. On the other side, you have all those sweet and fresh memories of the position you left behind, along with former co-workers, extended family, and everything else. What’s more, while getting ready for the big move, you couldn’t possibly foresee the loss you’ll be experiencing once uprooted. You couldn’t know how catastrophic will that feel at several levels. That’s because none of us is able to grieve before the loss actually happens. On a deeper level, this type of loss has been often associated with the one people experience when they lose a family member to a tragic death. Researchers divided this process into stages of emotional response called stages of grieving. Considered to be normal and expected to happen, these 5 stages are very similar to those a new immigrant faces once uprooted. People may experience these stages very differently: some might feel stuck in a certain stage, but play fast forward through another. The presented above sequence may be followed or not, yet typically no one gets to skip any of these stages. Reminds me of Kafka. Some researchers say that there are actually 7 stages of grief, while others argue that this theory doesn’t stand up very well. Nevertheless, my story today is not about who’s right or who’s wrong. 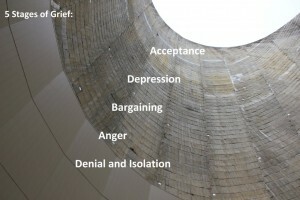 Over the years I have seen myself – and several people close to me – going through these grieving stages. At the time I didn’t pay much attention to the process as a whole, but it has become clear now that being able to recognize and understand these stages gives you a chance to identify, and eventually stop, a repetitive cycle. Keep in mind that grieving is a healing process – really important to our emotional comfort. Rolling through these stages enables us to accept the new reality we need to moved into. Acceptance implies that we build a realistic and detailed plan, become certain about getting a job, and follow a solid strategy to actually obtain it. This may take a while, but we should be certain that it is very unlikely to stay unemployed or underemployed forever. Let’s look at it from a different perspective. You are now in a new country, uprooted, and facing the risk of losing your professional identity, as your support (people who respected you for your achievements) is missing. You have now moved from introducing yourself as “I’m the HR Manager at ABC” to “I am looking for a new opportunity” or “I’m looking for a job.” Don’t keep busy being disappointed or angry – it’s a waste of time. Get support to develop a good strategy. To reach your employment goal will take flexibility, plenty of patience, and time. 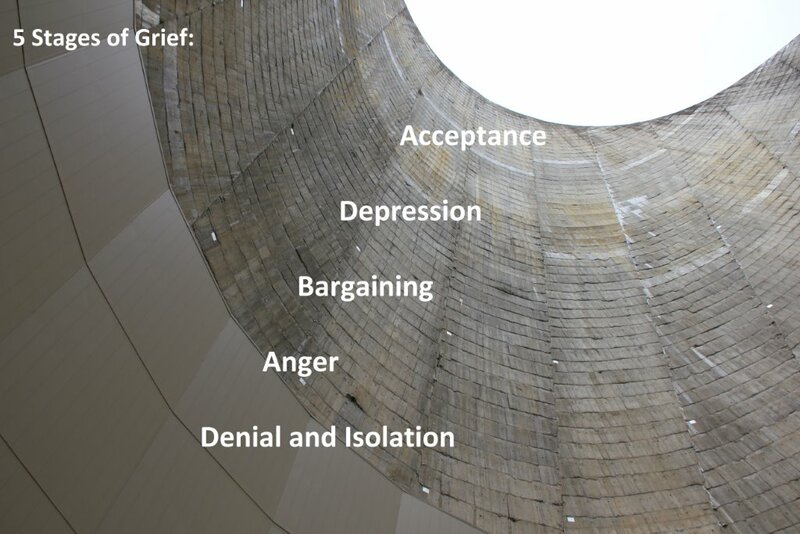 Many of us consider the process done once past the first two stages (denial and anger): “That’s it, we’re accepting the situation as is, we’re just fine.” Yet at this point, we have only reached to the bargaining stage of the grieving process. During this stage it still is difficult to set an employment goal as we left the door behind half open. Are we faking acceptance? Most likely. We resign. Resignation only deepens our pain and makes us bear our loss quietly. Acceptance comes with the realization that “this is better” and by “this” we mean the present situation as a whole. One can hardly fake it, it something that comes from inside, a glow anyone else will see right away. As the saying goes, each time a door closes, a new one opens – and most of the times it’s for the best. However, when new to a place, let that door behind you close firmly – let go of it – so you can look forward to the new one that’s opening in front of you. It’s almost like in a passing rite, you need to perform it properly to its very last detail, or else you will be lingering in that liminal state between the two worlds forever. When moved into the acceptance stage – a positive aura glows all around us and it becomes contagious. That’s the confidence you need to project when meeting a potential employer or during a job interview! It is this image, this positive aura, that weighs a lot in the final decision of your potential employer! Just remember – interviewers are not looking for a canned, rehearsed personality, but for a true attitude – and they have ways to make us reveal it. Unfortunately, interviewing before we got to the acceptance stage is the same as trying to sell a broken car. We need to respect our pain and find a way of transitioning it into happiness. Establishing a firm daily routine may help us stay focused. Internationally trained professionals belonging to a variety of industries are moving through a very complex experience. Learning how to navigate through and manage these new circumstances will in turn help you successfully manage your own life. Take time to stop and listen to other people who might be in a worse spot than you are. Helping others will in turn help you realize that not only you’re making a difference in someone else’s life, but in your own. Initially published by Magdalena on September 27, 2012 on the Skills Connect blog. New immigrants are in many ways comparable to new graduates, minus the fact that they have great work experience – but feel highly uncomfortable because they may lack a comprehensive understanding of the local workplace culture, may not be as self-confident in their approach, and may not have a local professional network to depend on. Networking is all about building relationships overtime – which means you have supposedly accounted for that even before arriving to Canada. Building relationships is more important than evaluating your credentials or going back to school because on the real job market a good reference will open doors and help you move up into the position you’re aspiring for. To network doesn’t mean to turn into a ‘networking mongrel’ and (1) collect a meaningless stack of business cards without ever following up, to (2) talk and focus on your own agenda instead of listening and gathering information, to (3) intrude or have superficial interactions. When meeting with someone you respect professionally for what they have achieved, take the time to build a real connection. There should always be a mutual benefit while networking, it’s a 2 way street. Using someone strictly for your gain will not bring along a successful relationship. 1. Know what you want – this may require extensive research, but if you don’t know what you want, nobody can help you. Most of this ‘Level 1′ research can be completed before arriving to Canada using the available websites, articles, online tools, and social media networks. 2. Prepare / make a target list (both professionals and companies you’d like to work for) and ensure you have acquired all relevant information, including LinkedIn connections. 3. Develop a list of specific questions you may ask in a possible informational interview and start a strategic planning around setting such meetings in the near future. 4. Avoid relying on friends only (or relatives) – this is your career and all the information has to be carefully cross-referenced using updated and reliable sources. 5. Get trained before connecting with professionals in your field/industry; it’s great if you can receive at least basic training from a certified career advisor on how to proceed: don’t blow your chances by showing up unprepared. Skills Connect program offers free one on one counselling as well as specific training sessions that cover a variety of areas. 6. Your start matters: have some good questions ready, display self-awareness, curiosity, openness, humility, authenticity, and be considerate – just a few traits to contemplate on. 7. Keep notes – once you commence your ‘career battle’ and start on building relationships, keep an activity tracker spreadsheet or have follow-up system in place and connect with your new acquaintances consistently.